Posters, with their history in marketing, communication and low-cost propaganda are designed to be both eye-catching and informative. Posters have been around almost as long as civilized society – they advertised the plays of Shakespeare, dammit! But, the modern poster, as we know it, can be traced to 1870 when the printing industry perfected color lithography which allowed for the possibility of mass production. Previously, all text or imagery could only exist in a black and white medium. Quickly adopted en masse by great European artists, the poster famously came to be used by Henri de Toulouse-Lautrec and Pierre Bonnard. The poster has been adopted by artists of many contemporary movements (in almost any language) – from Bauhaus to Art Nouveau to Surrealism to Cubism and Hippie Counter Culture. Not just for college dorm walls anymore! 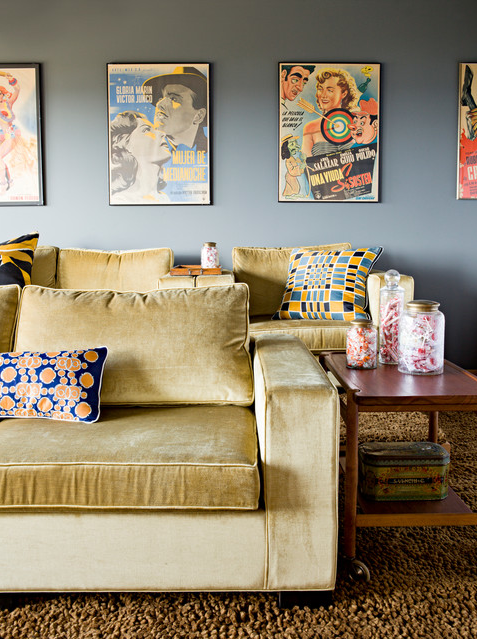 A home theater has inviting velvet chairs, funny Mexican movie posters and pillows made from vintage silk scarves. The home on the Oregon Coast was decorated by Jessica Helgerson Interior Design. Photograph by Lincoln Barbour. 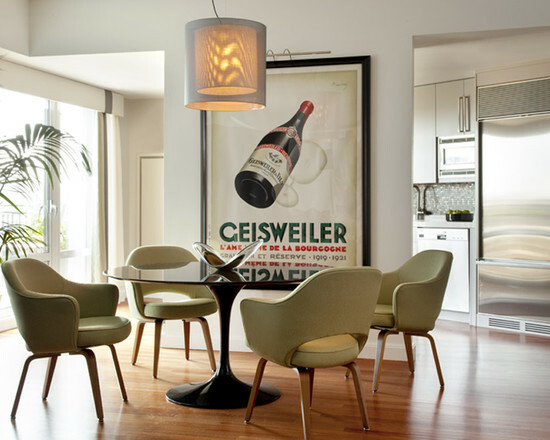 The classic, French wine and spirits poster features a simple image of a bottle laying back at an angle with a ghost of a glass superimposed. The Art Deco design was created by Lajos Marton in 1921. 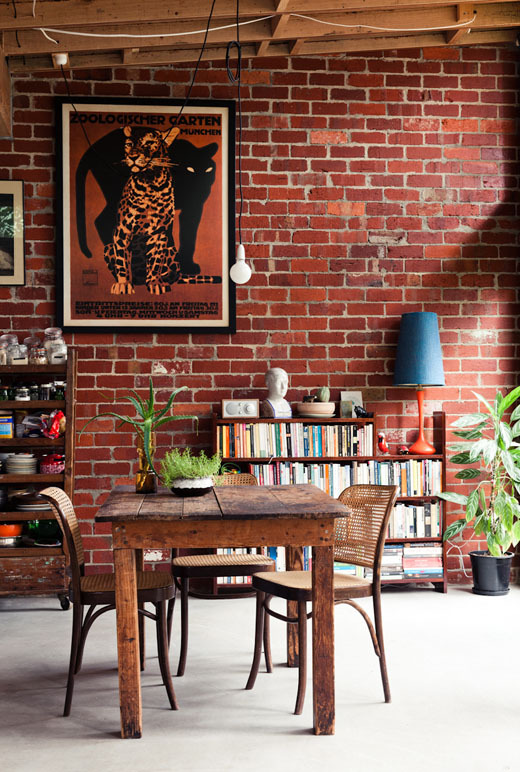 The clever image is an easy way to bring an antique, time-travelling vibe to an otherwise contemporary space. The Coburg, Melbourne home of Emilio Fuscaldo and Anna Krien. Photography by Sean Fennessy. Styling by Lucy Feagins of The Design Files. The color of an exposed brick wall, is the perfect backdrop for the German advertisement of Zoologischer Garten München featuring leopards. 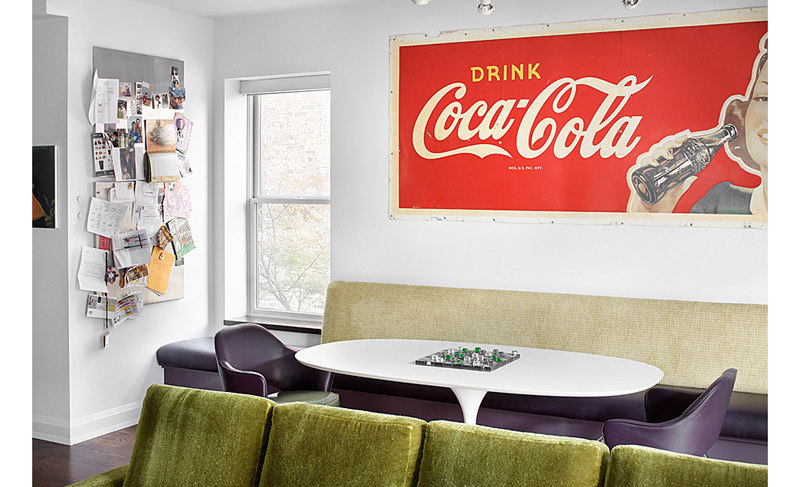 A Chicago, Illinois home, with close proximity to Wrigleyville, pays homages to the stadium lifestyle with a retro Coca Cola poster by Alan Design Studio. Not able to purchase reproductions or giclee canvas prints? Head over to FreeVintagePoster.com for 100% free downloads of classic designs. Many of the retro images are sourced from the Public Domain, Library of Congress and other libraries. Free Vintage Posters offers hundreds of high quality printable posters in advertising, travel, food, drink, art, movies, westerns, military, magic and more. Download these high-quality, professionally scanned beauties, print on heavy stock and frame them yourself for an decor inexpensive option! A contemporary residence in Hilldale, California by SÜZA Design features an incredible book and movie poster collection. To unifiy the multi-colored area, each poster was framed in a thin, clean and black, museum quality frame. All furniture and wall fixtures are in soft, neutral tones which allow the space to not become overwhelming. A fan of movie posters? Head to FVP for many retro options, here. 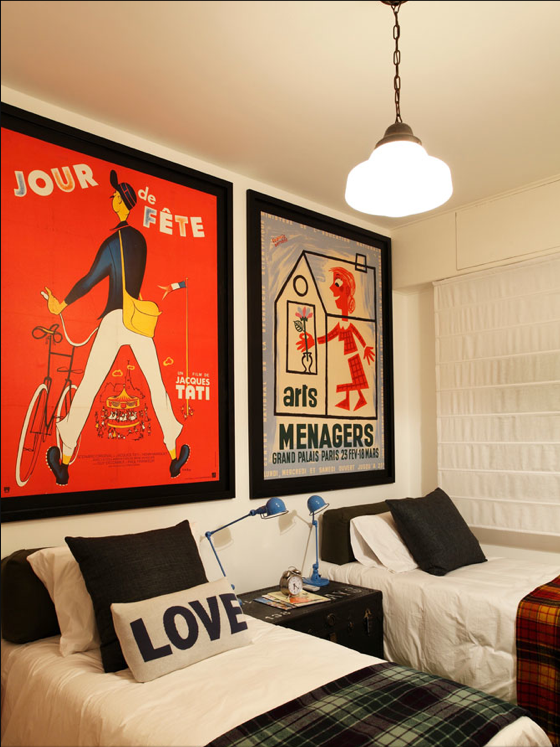 Ouriço Arquitetura e Design‘s vintage French posters bring levity to a children’s room. The space in Impanema is bright and cheery with a sense of humor. Jour de fête, is a 1949 French film by Jacques Tati. I particilarly love the industrial, blue table lamps on an antique trunk. In French, the word toile (phonetically “twall”) refers to a simple woven fabric, in fact the word in French means “linen cloth” or “canvas”. 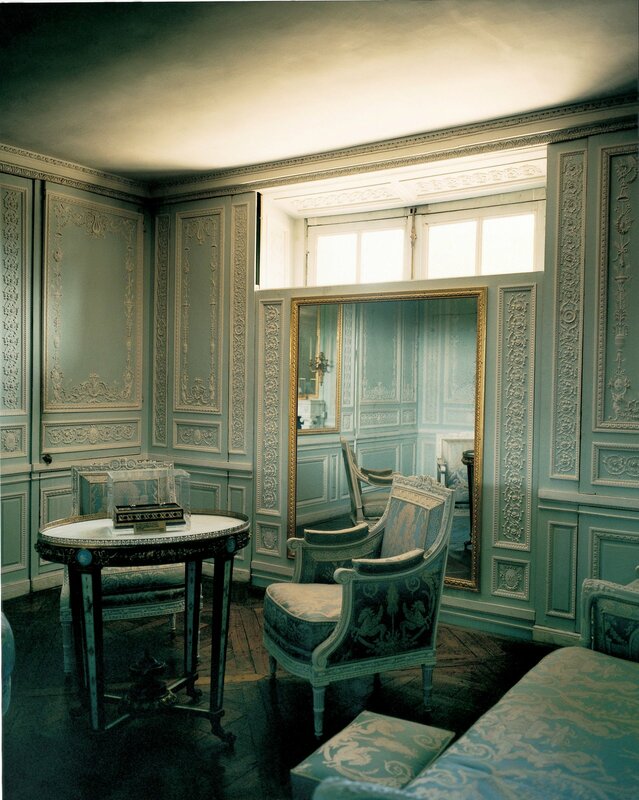 However, in interior design and haute couture, the term toile is mostly used in reference to “toile de Jouy” – a cloth from Jouy-en-Josas France which originated in the 18th century. This type of decorating pattern usually consist of a white background, on which a repeated pattern depicting complex scenes, can be found. The scenes are of pastoral farm life, picnics, high society, and any number of classic architecture motifs. The pattern consists of a single color, most often black, dark red, or blue. The fabric was extremely popular in France and Great Britain during the 18th century, and late in America during the Colonial Era. It’s time for the resurgence of this trend! 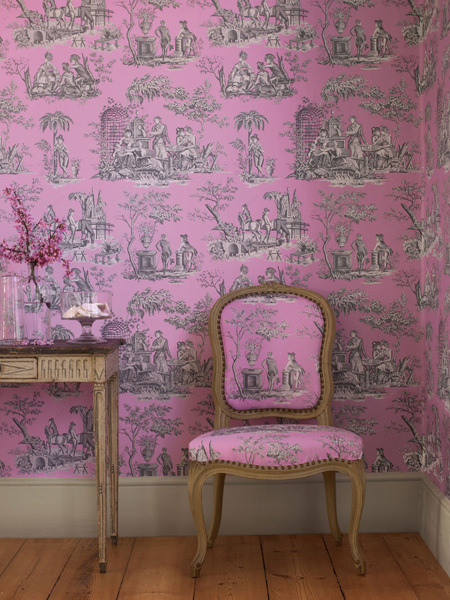 Colefax and Fowler does a modern take on toile wallpaper. Bright printed pillows, and a graphic (zigzagged!) patterned throw bring this bedroom into the 21st century. A turquoise, gilded headboard doesn’t hurt either. Photograph by James Merrell via Design Gumbo. 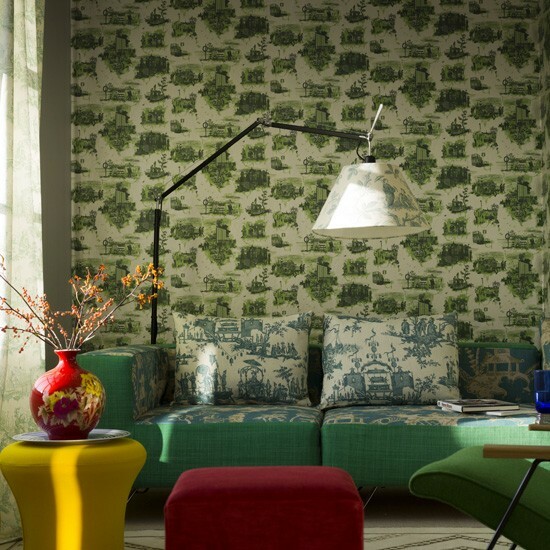 London Toile Brights by Timorous Beasties offers a neon take on English cityscapes. 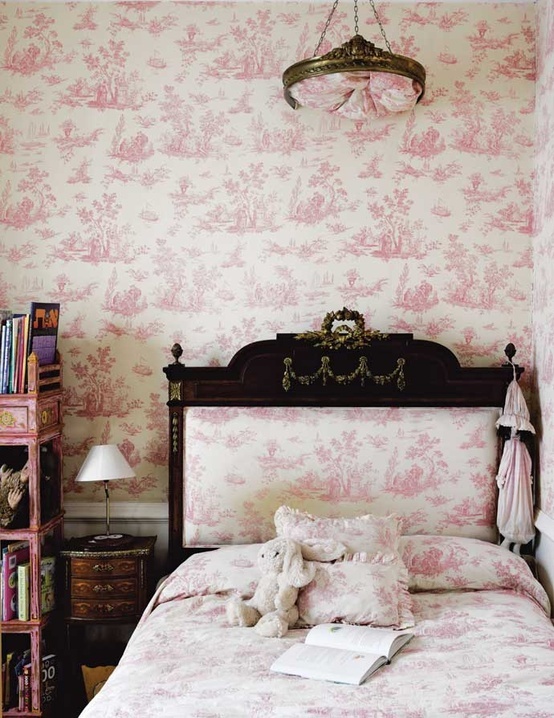 Pink Toile on Toile via Manuel Canovas, Paris. 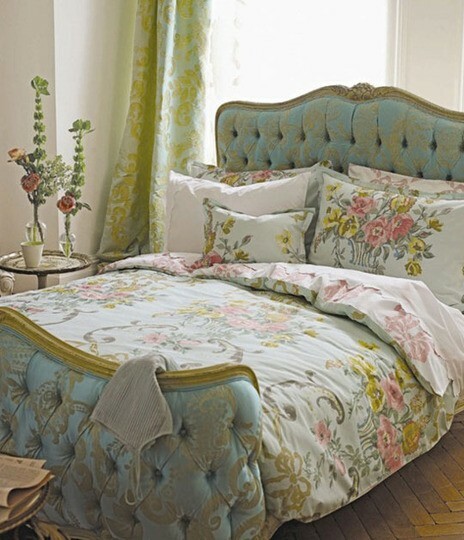 A toile, Japanese print screen acts as a headboard. 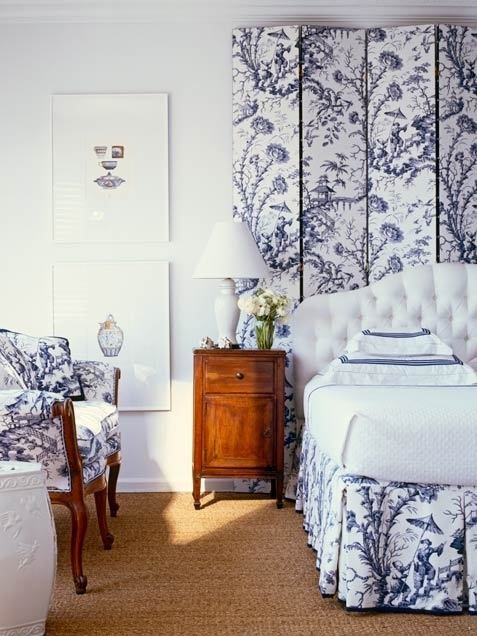 The bed’s dust ruffle and chair bring the nautical, fresh and revitalized Colonial bedroom to the present. Image via Surrender the Pink. A grown-up office space. I imagine myself closing envelopes with wax seals in this sohpisticated nook. The geode bookends match the Toile pattern perfectly. Like an aristocrat from days gone by, feel free to cover every surface with bucolic, toile scenes. Add some edge to the space by playing on the contrast of farm-scenes with more modern, colour-blocked upholstery. 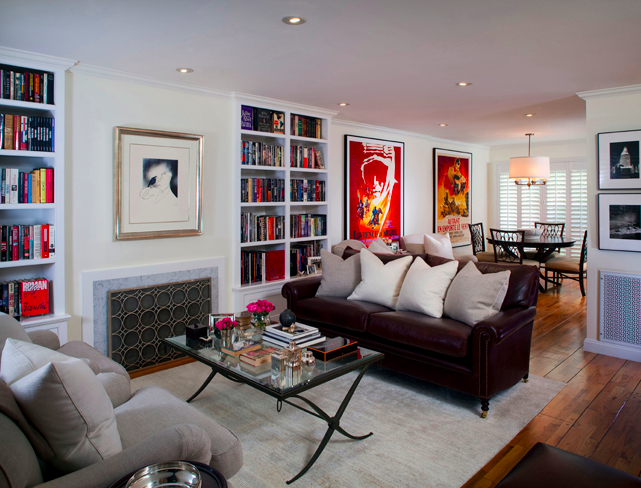 Midcentury Modern and geometric design elements finish off the eclectic space. Image via House to Home. 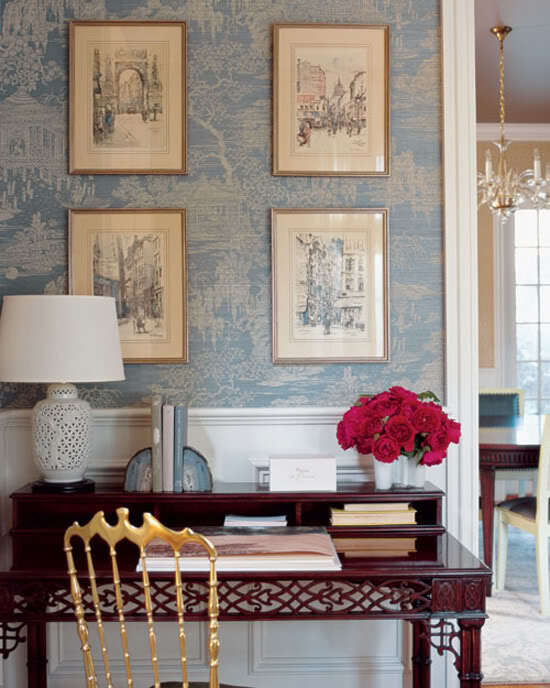 In the guest room of his Manhattan townhouse, Architectural Digest decorator Geoffrey Bradfield experimented with a black-and-white toile depicting the city skyline to create a modern take on a traditional design concept. The upholstered headboard was inspired by one in a Dubai hotel. 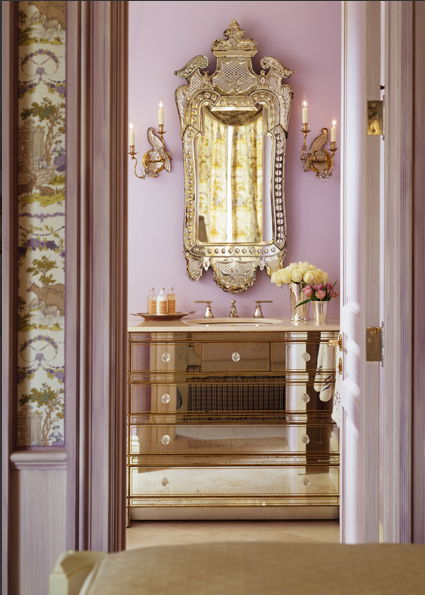 Image via Architectural Digest, September 2005. Photography by Durston Saylor. 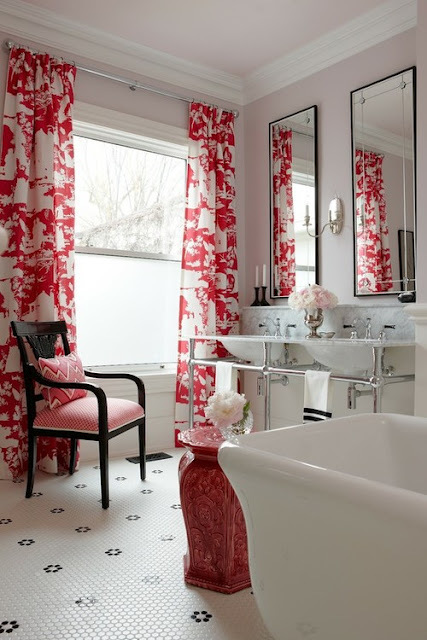 Toile drapes, pops of red, long mirrors and classic bathroom floor tiling allow this bathroom to be a space which I would not mine relaxing in for hours. I particularly love the industrial pipes-meets-marble His and Hers sink station. I will let the lavish, decadent landscapes speak for themselves. 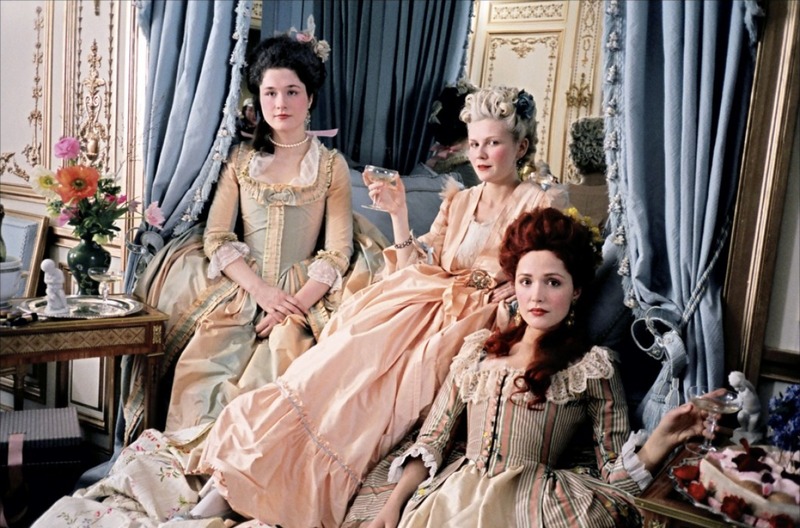 Welcome to the luxury of being an 18th century royal (minus the beheadings of course). 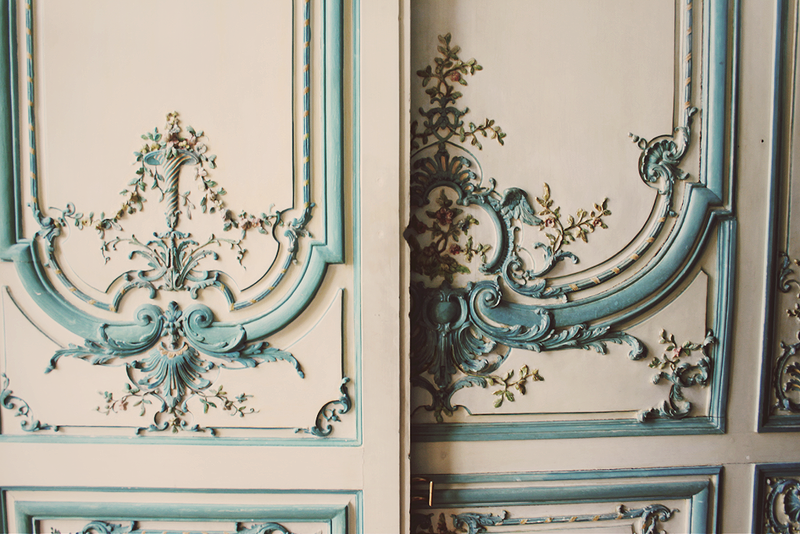 18th-century French art was dominated by the Rococo and neoclassical movements; the palaces, illustration and fashion of the rich often featured creamy, pastel-like colors, asymmetrical designs, curves and gold (e.g. gilded, leaf). 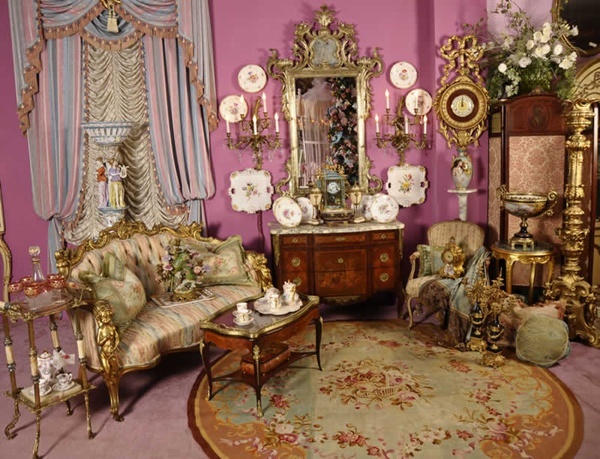 Whether a bourgeoisie, a pauper, or a courtesan, we can appreciate the meticulous and ostentatious beauty displayed by these ornate vignettes. Step into the fantastic and melodramatic influences! Chanel 2004 Spring Runway. Via. 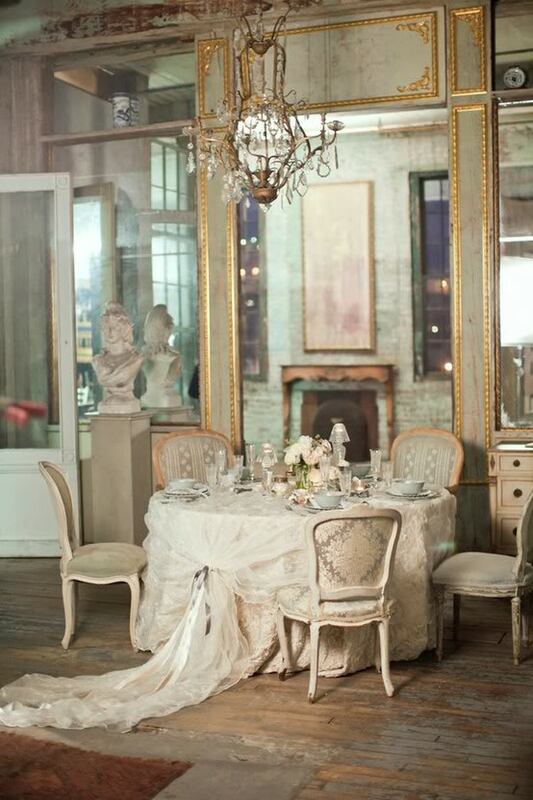 Welcome to my dilapidated yet stately Cinderella fantasy replete with a rustic French tables cape. Image found here. 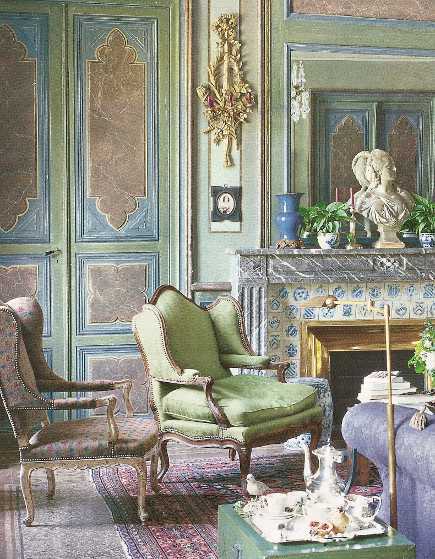 A French living room from the home of decorator and garden designer Jean-Loup Daraux, author of “By the Light of the Sea”. 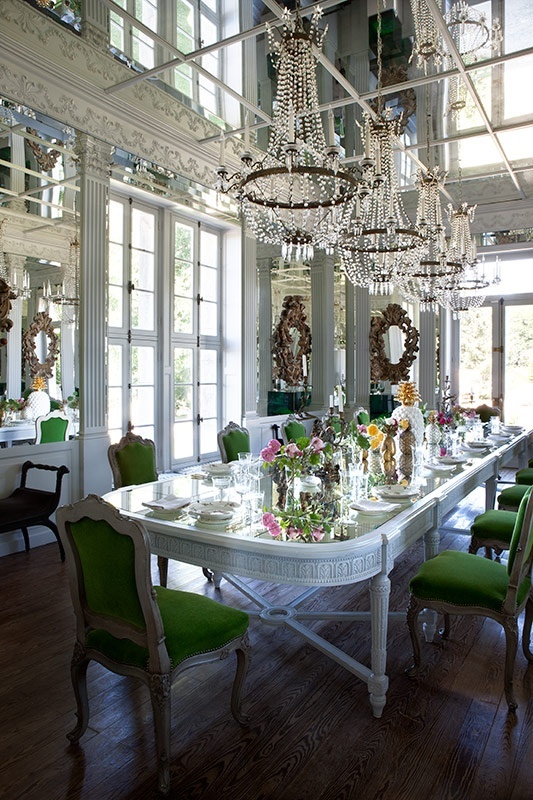 The luxurious volume En Passant par la Demeure (By the Light of the Sea) is a vivid photographic tour of the noted French interior designer Jean-Loup Daraux’s country home. Located in the south of France, in the Camargue region, the house is a stunning showcase of French country interior design. Image from House Beautiful. The Petit Trianon is a small château located on the grounds of the Palace of Versailles in Versailles, France. Image by Flickr user Romeika, here. I would demand breakfast in bed…Image found via. Oversized French Portrait Canvas – This uniquely beautiful oversized portrait of Manon Balletti (who was once engaged to Casanova) would make a wonderful statement piece in any room. The original painting hangs in the National Gallery. For purchase, click here. Emily Blunt, in Dior Haute Couture, photographed in Le Raincy, outside Paris. Bracelet by Mikimoto. Styled by Jessica Diehl. Image found in Vanity Fair, here. Kendall Wilkinson’s Seacliff Southern home photographed by Matthew Millman. Via. Cara Delevingne for Chanel Resort 2013. Via. Seriously frivolous is how Lagerfeld described his Chanel Resort 2013, shown on the crunchy gravel at the Chateau de Versailles in France. A scan from Marie-Antoinette and the Last Garden at Versailles, page 101. 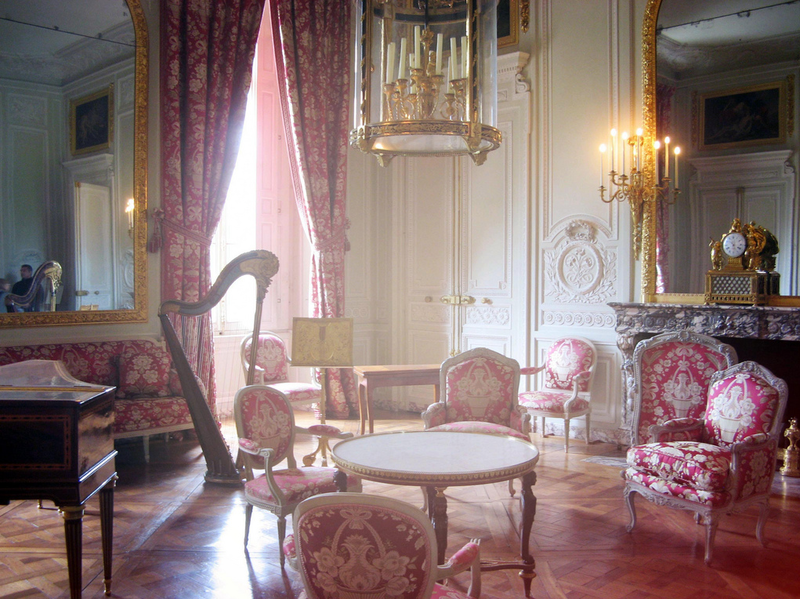 To escape the formalities and royal obligations of Louis XVI’s court, Marie-Antoinette created a private realm of pleasure for herself at the Petit Trianon and Hameau, where she planted the first Anglo-Chinese garden; created a trysting grotto; a working farm; and revolutionized architecture and gardening trends for the century to come. Marie-Antoinette’s entire private domain and its story are told in beautiful photographic detail by François Halard for the first time since its recent restoration and accompanied by well-researched texts by garden expert Christian Duvernois. 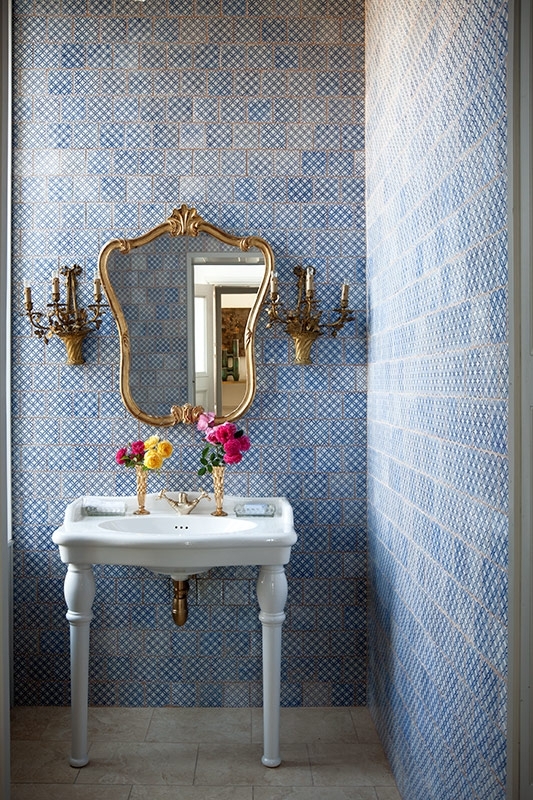 Crisp and saturated bathroom designed by Paul Raeside. 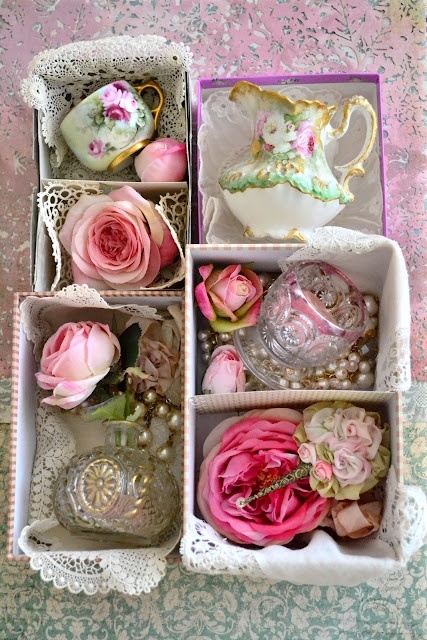 French furniture, antiques, and porcelain. Via. Versailles Historical Costuming via Concour de Style, here. This photo was taken on October 4, 2010 inYvelines, Ile-de-France, FR by Flickr user Pearled. There is not a misplaced napkin, flower, or fork in this Paul Raeside tablescape. Via. 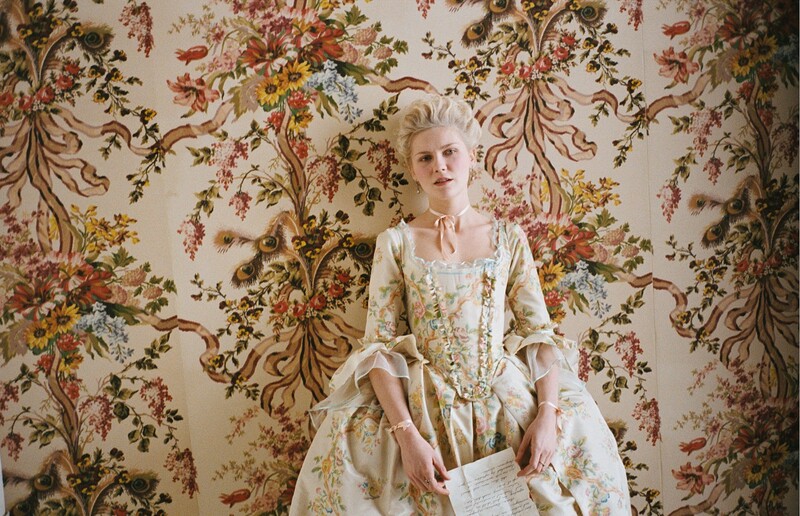 Screencaps from Sofia Coppola’s Marie Antionette, a retelling of France’s iconic but ill-fated queen, Marie Antoinette. From her betrothal and marriage to Louis XVI at 15 to her reign as queen at 19 and to the end of her reign as queen and ultimately the fall of Versailles.